This is a proof-of-concept device that shows that flexible smartphones are the future - but the poor performance in the hand and the chunky design mean that it doesn't wow in every way. 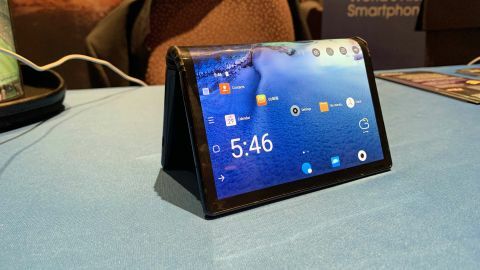 The Royole FlexPai is the first fully flexible smartphone in the world, and we got to try it at CES 2019. It has the potential to be a truly innovative device that could shape the future of smartphones. However, it's also an early version of this exciting tech, which means it's rough around the (flexible) edges. It's certainly given us an exciting glimpse of how smartphones with bendable screens will work, and the technology could be as groundbreaking as the HTC Vive or the original iPhone. The Royole FlexPai is available to buy in China right now, and comes in at a pretty hefty $1,300 (around £1,000 / AU$1,825). That's a high asking price, and while there's a developer version of the handset available in the US and Europe for $1,318 (around £1,035, AU$1,850) that comes with 128GB storage, and a 256GB model for $1,469 (around £1,150, AU$2,060), Royole recommends that consumers interested in the device should hold on for the final version of the handset. Like Google Glass, this is not something that the mainstream is going to buy. It’ll entirely be of interest to early adopters or those rich enough to say 'I had one of the first flexible smartphones'. When that final version will arrive still remains to be seen, but we're hoping it'll be sometime this year. If you order a FlexPai now, you'll be in for a little wait, with a 30-60 day delivery period as the firm gets to grip with production. Royole started shipping devices in December 2018, so they are rolling off the line. Let's get something out of the way now: the Royole FlexPai is only interesting because of the tech it contains inside. As a phone, it’s pretty terrible. The design is something of a necessity, and because it's got a screen that can bend around a 180 degree hinge, it's impressive this much tech has been added into such a small handset. What you've got is essentially two smartphones linked together by a 7.8-inch screen. When holding the Royole FlexPai, you can feel both the handsets as separate parts. When unfurled into a tablet, it’s a small and compact device, with a slightly chunkier bezel on the left-hand side, which features two cameras (more on that in a moment). When shut, it’s not a fully flat device, and more of a wedge, so it’s pretty chunky to hold in the hand, and it doesn't exactly slide into the pocket of skinny jeans. The screen is held in place by surprisingly strong magnets, so it shouldn't unfold itself. The screens on either side – which can be used as two phones with dual-SIM functionality – are a little hard to use with one hand, as the rubberized hinge in the middle makes it a little unwieldy to hold, especially when trying to use something like the camera. As for the 7.8-inch screen, it's fine in terms of sharpness, with a 4:3 screen ratio and a resolution of 1,920 x 1,440. This resolution isn't the most clear, but it doesn't feel too low-res either, and with a pixel density of 308ppi it's just what you need for the job. In comparison, the Samsung Galaxy Note 9 has a pixel density of 516ppi on its 6.4-inch display, while the Huawei Mate 20 Pro comes in at 538ppi on its 6.39-inch screen. Sadly, when the Royole FlexPai is completely open, it’s still not fully flat - the hinge stops it being a perfectly smooth plane. There's a small hump in the middle, which also irks when trying to use it as a tablet. When folded in half you get around two displays around 4 inches (with 16:9 and 18:9 aspect ratios) in size, with an option in the navigation bar to turn one side off to save power. However, you do get a sliver of additional screen on the hinge of the fold, providing shortcuts to apps such as the camera. Notifications will also appear on this hinge, as well as incoming calls. You can fire up the 18:9 'second' screen and use it as another device, utilizing the dual-SIM functionality built into the FlexPai. It means you can have a SIM for each side of the handset. Royole says the screen can last for 200,000 folds, which should see out the lifetime of the device. That would allow you to fold it over 100 times, every day, for five years. The Royole FlexPai has relatively slender bezels around three sides of the screen, but to the left of the display (when held in landscape) you'll notice there's a much thicker fourth bezel. This is where many of the components are housed, including the dual cameras, as while the screen is flexible, most of the other components won't be. There's a fingerprint scanner and a dual SIM tray next to a USB-C port, but there is no headphone jack on FlexPai. You do get a USB-C to 3.5mm connector in the box, although the set of earphones you get with the handset have a USB-C connection. The Royole FlexPai measures 190.3mm x 134 x 7.6mm (when in expanded mode) and weighs 320g, making it considerably heavier than most flagship phones, which tip the scales around the 200g mark. While the design of the phone isn’t brilliant, as it's chunky and hard to hold, but necessary to get that foldable screen, the software on this phone is terrible. Royole has applied its own Water OS software over the top of Android 9 Pie, and it's an extensive overlay, as the operating system needed major work to get it to skip between tablet and phone mode. We were told this is final production software, and it’s packing the new, top-tier Qualcomm Snapdragon 855 CPU, along with 6GB of RAM. With that in mind, it makes no sense that the model we used was just so slow to do anything. Taking a picture was slow. Turning from tablet to phone was slow. Opening the settings took a harder press and was… yeah, you guessed it. Slow. It’s not clear why the Royole FlexPai ran this way when it had everything inside to make it fly along, but we're guessing Water OS still has a long way to go in terms of efficiency. Sure, it’s got to constantly work out whether it’s using one or two screens, but that doesn’t mean that the camera shutter speed should be so awful. There are some nice user interface tweaks in the FlexPai though: the apps sliding along portions of the screen or the spine being used for quick app links is pretty cool. For those looking forward to the arrival of 5G in 2019, there's good news as the FlexPai will get support for the next generation network technology via a software update – although when this update will be pushed out is yet to be confirmed. There's also a 3,800mAh battery packed inside the handset, which feels a little small considering the size of the screen on the FlexPai. Both the Huawei Mate 20 and Samsung Galaxy Note 9 have bigger batteries. The FlexPai does offer fast charging, which will hopefully come in handy if the battery does run low. The Royole FlexPai has a dual-camera setup, with a 16MP wide-angle camera alongside a 20MP telephoto snapper housed in the chunky bezel to the left of the screen (when viewed in landscape tablet mode). There's a flash, and the cameras feature OIS (optical image stabilization) which should hopefully aid their low-light performance. Due to the folding nature of the FlexPai, there's no separate selfie camera, as the handset can be folded to make the cameras either front or rear facing. The camera quality, which uses a dual sensor, isn’t anything to write home about, and recorded video quality was merely OK. Again, nothing mind-blowing, but it was nice being able to fold the phone and have it stand up by itself. That was novel. Look, we know we’re come down pretty hard on the Royole FlexPai, but that’s because you shouldn’t buy it in its current state. The software is just not up to the job and needs to be improved massively before you think about buying this incredibly expensive phone. What it does do is give a sense of the future. It shows us that Royole knows what it’s doing in flexible screens, and arguably this is what the FlexPai is: a demonstration of that. After using this phone, we’re certain that we’ll be seeing phones that fold into tablets and more in the near future – and that’s awesome.